Bishops Stortford Ukulele Society (BSUS) meets at The Emmaus Centre next to St James Church, Thorley every Wednesday from 7.30pm to 10.00pm. Just come along, bring your uke, and have fun. Check out our Diary for dates of our practice sessions and gigs. Our members are at all levels and we even have one or two experts. You can come for some or all of the session but it can be overwhelming for absolute beginners/learners. 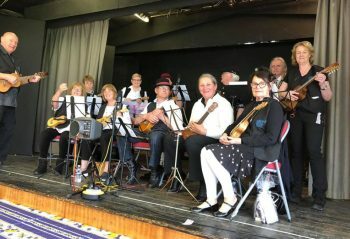 Therefore we’ve introduced lessons and separate sessions for them at our home on a Monday or Tuesday evening, to try simple strum techniques and chord changes etc. In the general session at the Emmaus Centre we play songs from our 2 Song Books (100 Songs in each) and rehearse for gigs till 9.20pm. After a short break there is a “round the table” for those wishing to perform a song and we finish the evening with requests for some of our favourites till 10.0 p.m. We pay £5 a session. Contact us for more information. 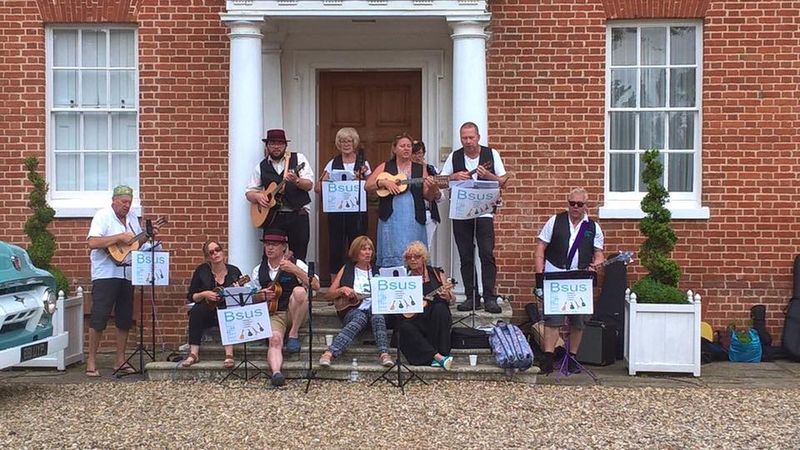 We also play local fetes and festivals, private parties and we organise several charity gigs each year. See the Diary for dates of our gigs and sessions. BSUS also has a Facebook page. Please join us to get more information about our gigs.